This article is the first in a series of profiles of impact development projects produced in partnership with guest editor Gregory Heller. Impact development is a term that describes real estate projects that serve a social purpose. This series explores how impact development projects are reshaping our cities and leaving their mark on communities and the lives of the people in them. Sequane Lawrence wanted to give Chicago residents somewhere warm and welcoming to go. Somewhere they had ownership. Not a park. Not a museum. But somewhere adults and children, regardless of race or income, could go to look for opportunity. He wanted to show his fellow citizens that there could be beauty and possibility not just in the tony suburbs or the upper-middle-class neighborhoods on the city’s north side. The Chicago Center for Arts and Technology was born out of both a need in the city and a practical plan to better its future. The Chicago Center for Arts and Technology (CHICAT, for short) opened its doors this week on 13th Street, just south of the Loop. 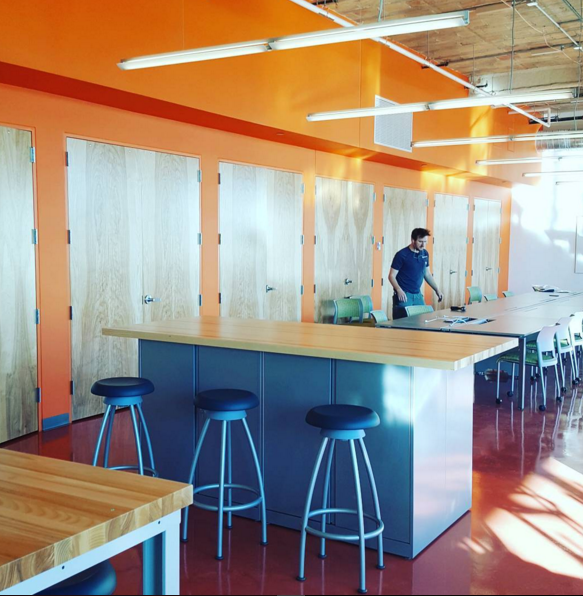 It is a community center that will offer tuition-free arts and technology courses for Chicago youth and vocational and skills training for adults. CHICAT is no backyard, bootstrapped sweat equity affair; it’s a state-of-the-art, $12.9 million, 25,000 square foot LEED-certified building financed with a combination of federal and Illinois state New Markets Tax Credits, foundation and private philanthropy — including major gifts from payroll software giant Paylocity’s CEO Steve Sarowitz. Lawrence, a Chicago native, saw a need. A self-professed “workaholic,” in late 2013 he was still working full time at local nonprofit, Fathers, Families and Healthy Communities, and putting in at least three to four hours moonlighting laying the groundwork for CHICAT. He resigned from his day job in 2014 to tackle CHICAT full time. The Chicago region had been gutted by decades of deindustrialization and the hollowing out of manufacturing. But, he said, there are still skilled jobs out there. And he saw an open lane to give people the training they needed. CHICAT’s adult training will cater to 18-25 year olds, but Lawrence stressed they won’t turn anyone away because of their age, saying “all are welcome.” The health care programming will offer training in medical billing and coding and medical assistance (like becoming, say, a nurse’s assistant in a hospital). The manufacturing training will focus primarily on food manufacturing with tracks for lab techs and quality control, giving people the skills to go into large-scale food manufacturing plants and, for example, work on testing diagnostics to ensure a product has the proper sugar-to-yeast ratio. Another program will offer training for maintenance mechanics, paving the way for jobs fixing machines and robots in manufacturing plants. The youth programming takes a 21st century approach to after-school programming, offering job-ready skills training, rather than finger painting or kickball. The umbrella term is digital arts, which encompasses a broad-but-focused set of classes: Digital photography, audio and video production, graphic design, animation, 3D printing, coding and cartooning. High-ceilinged spaces first built for the industrial economy of 100 years ago have been converted into airy, high-tech design labs and maker studios. 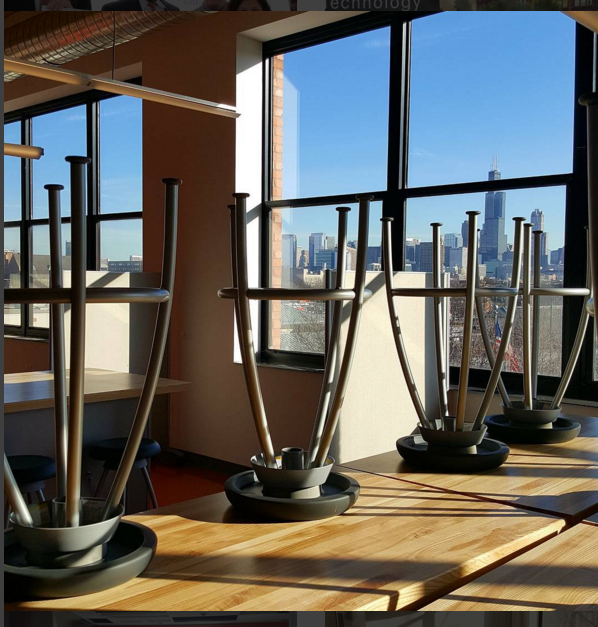 But beyond the training and programming CHICAT will offer, Lawrence feels the physical space — a gut renovated 1920s paint factory with a sturdy brick facade and big windows that look out to the city’s soaring skyline — is as important as the training and programming inside. He wanted to ensure that low-and-middle income Chicagoans felt like they had somewhere beautiful to go and call their own. “I think we still are in need of this model where the emphasis is on environment, beauty for low-income people. That there’s a real investment, a real serious investment on making sure that that low-income kids in Chicago and families in Chicago have the same thing that families have in [outlying suburb] Skokie,” he explains. Lawrence’s operation is a bit of an anomaly in another way too. It can take years and even decades for a project like this one to go from the late-night brainstorming and rendering stages to bricks and mortar. For CHICAT, it was a three-year process from the initial planning stages to the grand opening this week — practically lightning speed for a large, nonprofit development project. Lawrence, who has spent years working in community development, will be the first to admit that he was even surprised by how quickly it all came together. CHICAT didn’t start renovations on their building until January of last year, the same time they were incorporated. They now have a $2.5 million annual operating budget that is supported by grants from individuals, corporations and foundations, including the Polk Brothers Foundation, Field Foundation and Julian Grace Foundation. The way in which CHICAT got its footing is quickly becoming legend in Chicago community development circles. Years ago, Steve Sarowitz the founder of payroll software giant Paylocity, which is based in nearby Elk Grove Village, had told the godfather of community development and sector-driven training, Bill Strickland “I’m going to come into some money, and I’m going to help you,” recalls Lawrence. After Paylocity’s IPO in 2014, as Lawrence tells it, Strickland — the CEO of Pittsburgh’s influential Manchester Bidwell Corporation, a MacArthur “Genius” Fellow and a de facto mentor to community development organizations across the country — got that call. With Sarowitz on board, Lawrence and his team began to pursue the other sources of capital they would need to finance the building. They worked doggedly to secure federal and state New Markets Tax Credit allocations, no small feat considering the steep competition for the financing tool. The federal New Markets Tax Credit program was created by the U.S. Department of Treasury’s CDFI Fund in 2000 as place-based gap financing designed to encourage investment and development in neighborhoods with high poverty rates. The NMTCs were a game changer for the project, allowing CHICAT to bring in about 65 cents of additional subsidy on every grant dollar that they raised. CHICAT relied on their resources and network to put the NMTC package together, tapping Neel Shah, a New York-based financial advisor experienced in NMTCs. Shah’s firm, Shah Capital Advisors, helped secure the $17.5 million in federal and state NMTC allocation from the Chicago Development Fund (CDF), Cinnaire and Chase (who was also the investor for the credits), resulting in $5.1 million in NMTC equity for the project. The rest of the funding comprised an impressive $7.8 million that CHICAT raised in foundation and corporate grants. The CDFI Fund scores financial institutions that apply for credits based on an array of factors including the community outcomes of the projects that they financed with their credits in past rounds. For this reason, when looking to place their credits in projects, financial institutions seek deals that have strong community impacts including job creation for low-income persons and low-income communities, and community goods and services. In the case of CHICAT, Shah felt that the job-training aspect and in particular, the career training opportunities for both low-income youth and adults, gave a leg up above competitors. In its first year, CHICAT is aiming to provide job training and job placement services to a minimum of 90 adults and mentorship and educational programming to at least 120 students. The Center also can boast a strong board, key for any high-impact nonprofit. Sarowitz sits on the body alongside Strickland and a host of Chicago community leaders, ranging from the CEO of the metropolitan YWCA to a local alderman. 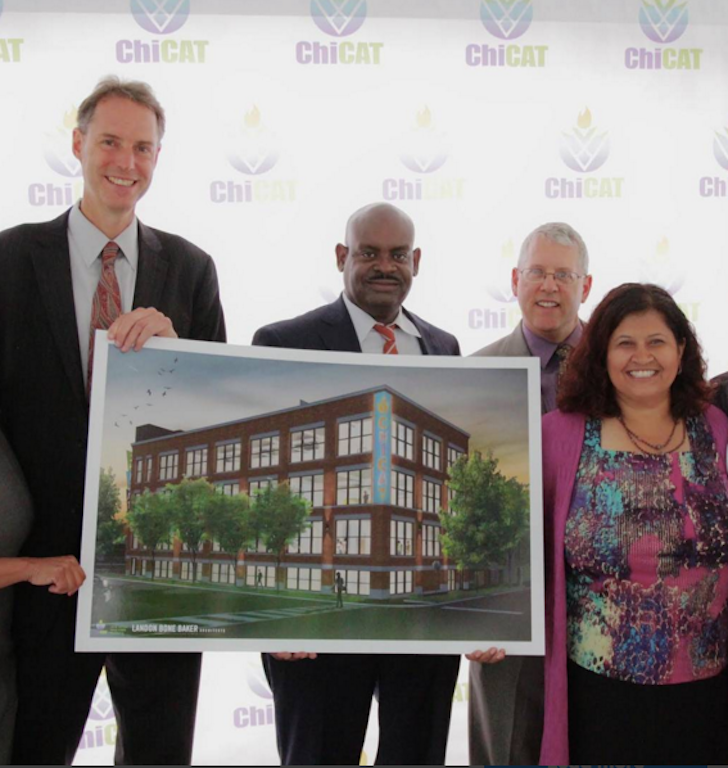 That board is essential for long-term sustainability and was a pivotal factor in CHICAT’s ability to raise the level of grants needed to finance the project. Lawrence warns that some of the biggest mistakes and financial miscues come from lack of oversight or inattention to the little things. Costs add up. Sourcing matters. Supply chain matters. Even on something as boring as benches. “Just really staying on top of cost and really doing more due diligence than you think you might need to,” Lawrence told Next City. Note: This article does not reflect the views of the Philadelphia Redevelopment Authority or the city of Philadelphia.